Given that runways are labelled by magnetic heading. What happens in airports that have more than one in the same direction? Are there any such airports? For example, Heathrow has 27 left (27L) and right and 09 left (09L) and right. See here for the airfield chart. You can see the numbers close to the end of the runways. 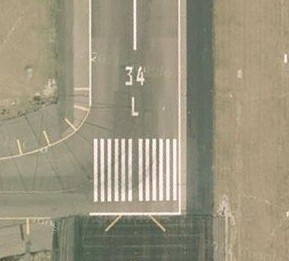 Here's an example for an airfield with a 34 left runway. If there are more than three runways more or less parallel, one or more runway numbers will be shifted by 10 degrees, e.g. 08L, 08C, 08R, 09R. At large airports with four or more parallel runways (for example, at Los Angeles, Detroit Metropolitan Wayne County, Hartsfield-Jackson Atlanta, Denver, Dallas-Fort Worth and Orlando) some runway identifiers are shifted by 10 degrees to avoid the ambiguity that would result with more than three parallel runways. For example, in Los Angeles, this system results in runways 6L, 6R, 7L, and 7R, even though all four runways are actually parallel (approximately 69 degrees). At Dallas/Fort Worth International Airport, there are five parallel runways, named 17L, 17C, 17R, 18L, and 18R, all oriented at a heading of 175.4 degrees. Occasionally, an airport with only 3 parallel runways may use different runway identifiers, for example when a third parallel runway was opened at Phoenix Sky Harbor International Airport in 2000 to the south of existing 8R/26L, rather than confusingly becoming the "new" 8R/26L it was instead designated 7R/25L, with the former 8R/26L becoming 7L/25R and 8L/26R becoming 8/26.